The world's largest antimony mine has become the world's largest laboratory for studying the environmental consequences of escaped antimony -- an element whose environmental and biological properties are still largely a mystery. 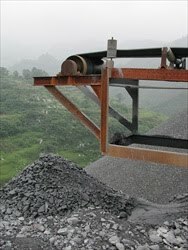 Scientists from Indiana University Bloomington, the University of Alberta, and the Chinese Academy of Sciences have found the waters around Xikuangshan mine in southwest China contain antimony at levels two to four orders of magnitude higher than normal (0.33 - 11.4 parts per million). The scientists' report will appear in an upcoming edition of Environmental Geochemistry and Health (now online). "Antimony is an emergent contaminant," said IU Bloomington Ph.D. student Faye Liu, the paper's lead author. "People have not paid enough attention to it." Used in small quantities, antimony has a wide variety of applications -- from hardening the lead in bullets and improving battery performance to combating malaria. Little is known about antimony's toxicity, in part because the metalloid element is usually found at low, parts-per-billion concentrations in natural environments. At Xikuangshan, Liu and her colleagues found that aqueous antimony concentrations could be as high 11 parts per million, 1,000 times the antimony levels found in uncontaminated water. The alarming circumstances at Xikuangshan present an opportunity to understand what happens to antimony, geologically and chemically, when large quantities of it are introduced to the environment. That knowledge will be useful to investigations of antimony contamination near factories and military bases around the world. The U.S. Environmental Protection Agency and similar regulatory agencies in Europe operate under the assumption that antimony's properties are similar to those of arsenic, another element in antimony's chemical group. "That will need to change," said IU Bloomington geologist Chen Zhu, Liu's advisor and the project's principal investigator. "We saw that antimony behaves very differently from arsenic -- antimony oxidizes much more quickly than arsenic when exposed." The vast majority of antimony the scientists isolated at Xikuangshan was of the "V" type, an oxidation state in which the metal has given up five electrons. It is believed V is the least toxic of the three oxidation states of which antimony is capable (I, III and V). It is not known whether antimony-V's relatively diminished toxicity is upended at Xikuangshan by its overwhelming presence. Land within and around the mining area is used for farming. The drinking water plant for local residents was built in the mining area. Zhu says health problems are common at Xikuangshan, possibly the result of antimony intoxication. Zhu says he is discussing a possible collaboration with IU School of Medicine toxicologist Jim Klaunig. Researchers would return to Xikuangshan to determine whether the elevated antimony can be tied to acute and chronic health problems among those who live in the vicinity. Another possible study group might be those Chinese who live downstream of Xikuangshan along the Qing River. As part of their Environmental Geochemistry and Health study, Zhu and scientists from the Chinese Academy of Sciences conducted field work at Xikuangshan in 2007, drawing multiple water samples from 18 different sample sites. Samples were shipped back to Bloomington for atomic fluorescence spectroscopic analysis and to Alberta for inductively coupled plasma mass spectroscopy analysis. The scientists learned antimony-III was rare, beyond detection or present at trace levels. The near totality of antimony in each water sample was antimony-V. While Zhu was on sabbatical leave in 2008, Faye Liu was advised by IU Bloomington biogeochemist and inaugural Provost's Professor Lisa Pratt. Zhu and Pratt recently began a joint project to learn more about the biogeochemistry of antimony. The scientists' antimony research complements their concurrent NSF-funded research on arsenic. IU Bloomington geologists Claudia Johnson and Erika Elswick, both participants in the Environmental Geochemistry and Health study, have also taken seawater samples from the Caribbean. Liu is investigating the samples' antimony content.